I’ve seen Black-capped Chickadees work their wonder on even the toughest of men. Once they begin to talk about these birds and their visits to their bird feeders, words like “cute” and “adorable” start to become part of their conversation. And rightly so! This is one of the best parts of my job as the owner of Wild Birds Unlimited in Grosse Pointe Woods! Black-capped Chickadees are the darlings of the bird world. This tiny bird, only five inches in length and weighing .3 to .5 ounces, has a short neck and large head, giving it a distinctive, rather spherical body shape. The tail is narrow and long, which can be noticed at a distance. The short bill is one of the cutest features – a bit thicker than a warbler’s but thinner than a finch’s. The cap and bib are black, the cheeks white, the back soft gray, the wing feathers gray edged with white, and the underparts soft buffy on the sides grading to white beneath. The cap extends down just below the tiny black eyes. The average age that a chickadee reaches is two to four years with the oldest living chickadee on record having attained the age of twelve years and five months. In addition, their behavior and their voice add to their cuteness factor. Chickadees fly with a slight up and down roll instead of in a straight line. Their wings blur in short, fast bursts of speed. They can cling to feeders in a number of positions. When eating in the wild, they are foliage gleaners, turning every way necessary to inspect for insects and seeds. It seems that everyone learns the namesake call of a chickadee as his or her first bird “song”. The more dee notes in a chickadee-dee-dee call, the higher the threat level that is being communicated to others. Most birds that associate with chickadee flocks respond to chickadee alarm calls, even when their own species doesn’t have a similar alarm call. The territorial/mating song of the Black-capped Chickadee is a simple, pure 2 or 3-note whistled descending “fee-bee” or “hey, sweetie”. Chickadees are one of the easiest birds to attract to bird feeders, coming to suet as well as a variety of seeds including sunflower, safflower and peanuts. They acclimate to all types of feeders as well. Black-capped Chickadees seldom remain at feeders except to grab a seed to eat elsewhere, holding the seed between their feet and using their tiny bill as a chisel to remove the shell. Chickadees will store seed away in anticipation of winter, a process called caching. One of the most fascinating facts about chickadees is their capacity to remember where they cached their seeds. In their brains, neurons contain long-term memory and are used to store the information regarding seed location. Once a neuron contains a long-term memory, it is permanently altered, no longer able to be used in circuits involved in new memory formation. Small birds are able to allow neurons containing old information to die, replacing them with new neurons so they can adapt to changes, including the new location of stored food. Researchers at the Rockefeller University found new neurons in the chickadee hippocampal complex throughout the year, peaking in October, just in time to cache for the winter! How do these little sprites manage to survive through the winter? Chickadees use a “scarf” strategy, with feathers covering their nostrils in order to pre-heat the air that enters their lungs. Fluffing their feathers is another winter strategy utilized by Chickadees. A study done to measure the effectiveness of this strategy showed that in zero degree weather, the temperature next to a Chickadees body was 70 degrees as a result of the insulating ability of the fluffed feathers. In addition, when they are molting for fall plumage, they grow back 30% more feathers for insulation. Chickadees are also able to go hypothermic each night, dropping their core temperature down by 15 degrees. This allows them to conserve up to 25% of their energy needs. 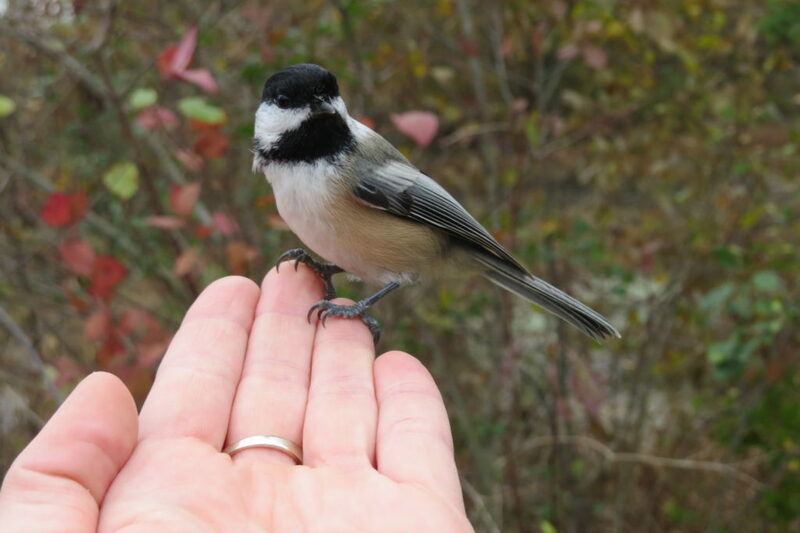 Chickadees also have the ability to shiver for a prolonged period of time, which helps to produce body heat. There is an organ inside of a chickadee’s ear, the Vitale organ, which detects changes in barometric pressure, signaling a change in the weather. This explains the flurry of activity at the feeder before an on coming storm! 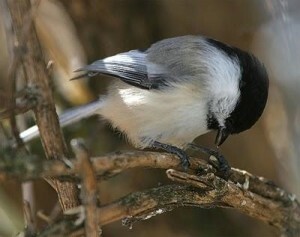 Chickadees use cavities to spend the night, which also affords them protection from the elements. Leaving a nest box (bird house) out during the winter may help them in the event of a shortage of natural cavities, such as those made by woodpeckers. Chickadees mate for life and the pair is the core of a winter flock. Other non-breeding chickadees within that flock are generally not the offspring of the adult pair. Other bird species that associate with chickadee flocks in the winter include nuthatches, woodpeckers, kinglets, and brown creepers. Whether in the field or watching through your window, I hope that you have a chance to be entertained by Black-capped Chickadees.